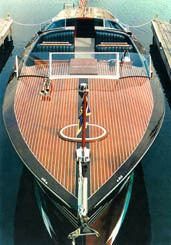 Antique Boat Tours.com is a return to the Elegant Lifestyle that was Wooden Boating. Your personalized Luxury Boating excursion will be aboard a stunning 42 foot, one of a kind Custom Built Hackercraft called the Pardon Me Too. We can offer a broad range of personalized luxury excursions all throughout the magnificent 1000 islands and the Might St. Lawrence River navigating easily between Clayton and Alexandria Bay, New York. Whatever the occasion, we have the perfect cruise to celebrate in style and elegance. Contact us now to discuss your personalized tour. Copyright 2008. AntiqueBoatTours.com. All rights reserved.